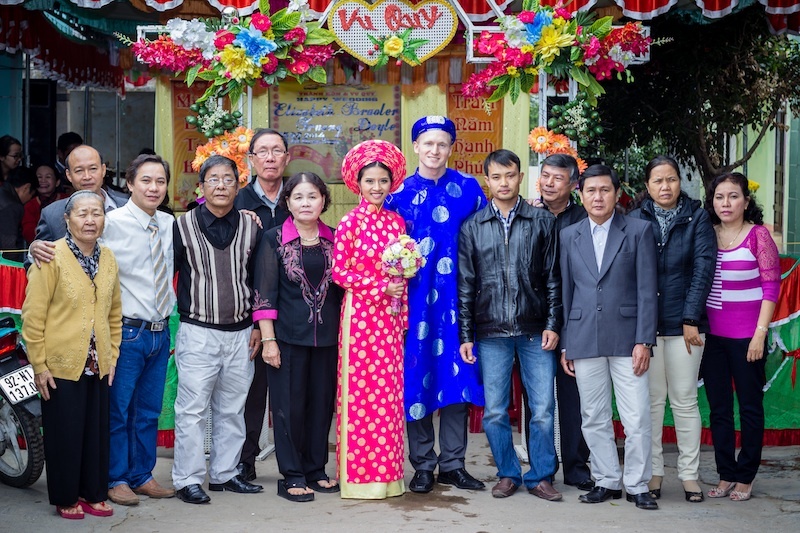 Since both sides of Liz’s families live so far apart from each other, we decided we would hold 2 traditional Vietnamese wedding ceremonies in our first and probably most meaningful country – Vietnam. We chose to hold our first wedding ceremony on February 13th because it is Liz’s parents (Chanh and Hong) anniversary, celebrating 37 years this year! And we wanted to honor them by having these ceremonies with their families back in their home country. Liz’s parents immigrated to the United States during the Vietnam War in 1975 at the age of 18 (Chanh) and 16 (Hong). You can read a recap of their story of coming to America on Liz’s personal blog here: Liz’s parents story on coming to America. 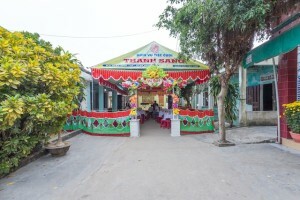 Their families still remain where they grew up – the Truong’s (Chanh’s side) in Ho Chi Minth City, and the Hoang’s (Hong’s side) in the little fishing village of Nui Thanh in Central Vietnam. Liz’s Ba Noi (Grandma, aka Chanh’s mom) still lives in the same home Chanh grew up in. 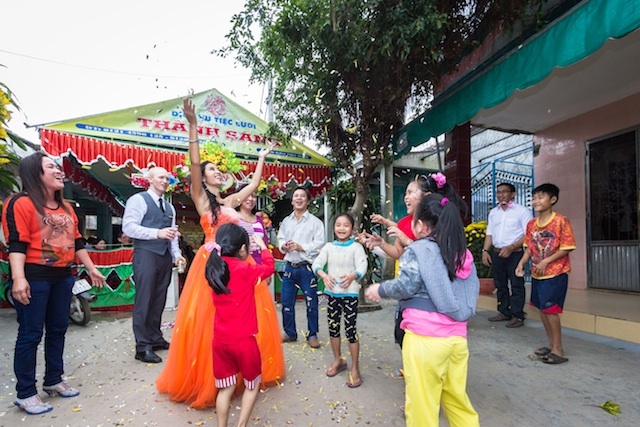 Liz returned “home” to Vietnam for the first time in 2011 in an emotional journey to meet her extended family for the first time, and the first of the Truong family from America to go back. For a recap on her first trip home, you can read it here: Liz’s first journey home to Vietnam. 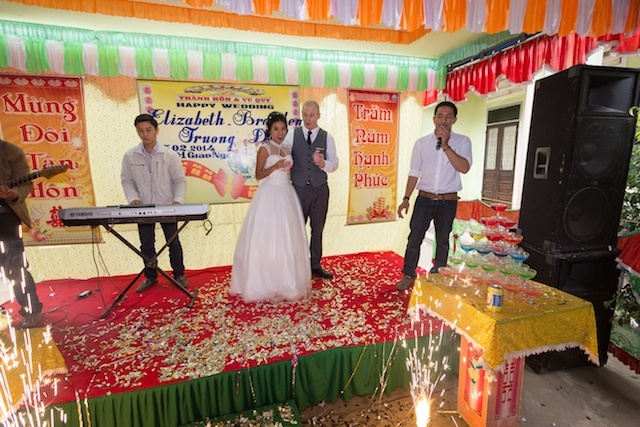 Coming back to hold our first wedding for Liz’s parents in Vietnam was definitely not short on emotions. It was truly an honor to be there to include everyone in such an important time in our lives, and have them take part in the celebration. Above all, however, we are so grateful that we are able to represent Liz’s parents in Vietnam on their behalf while they are away. We can truly feel when our Vietnam family expresses love for us, that in large part it is their expression of love and longing for Liz’s parents. 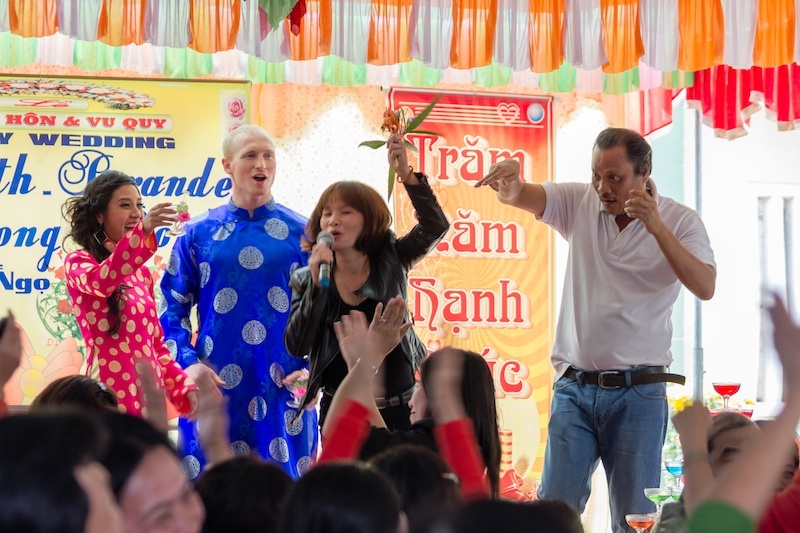 After HCMC, we transitioned into the laid-back fishing village of Nui Thanh on the central coast of Vietnam, where the Hoang side of the family resides, and where hospitality is the king of all kings. 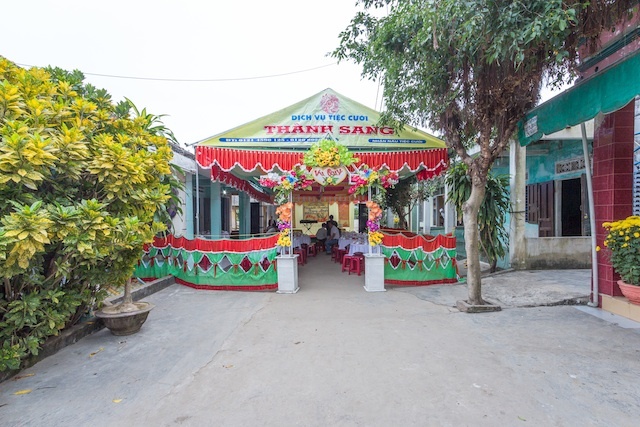 Situated in the Quang Nam Province on untouched, sandy beaches backed by lush, green jungle, this area is known for it’s food, charm, and the best hospitality in all of Vietnam. Anyone that has met Liz’s mom knows this is definitely where she came from, because it more than lived up to it’s reputation. Fact. These people know how to show you a good time. Because we had 2 ceremonies, we will sort of “blend” the two to give you the recap of the similarities, differences, and the amazing moments of love we got to share with Liz’s family over the Valentines Day (and Chanh & Hong’s anniversary) weekend. In Vietnam weddings, the traditional dress is called an “Ao Dai” consisting of a long gown with high slits, wide-legged pants and a circular hat – guys “Ao Dai” to match. 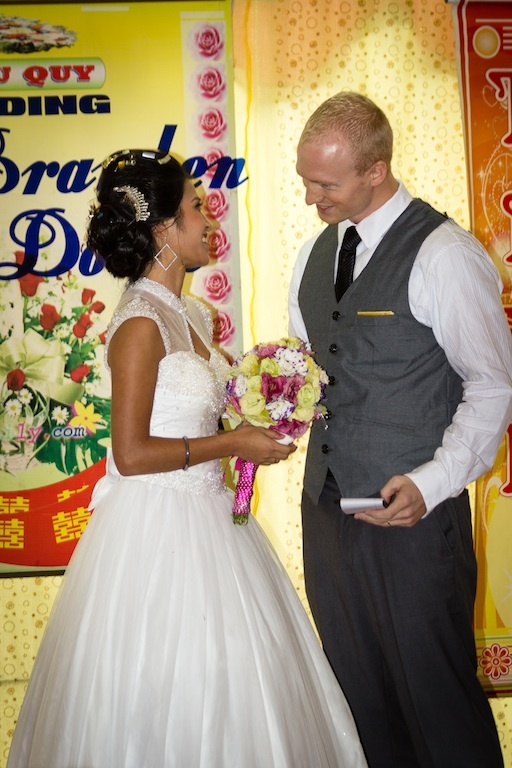 In our city Vietnam wedding we wore the Ao Dai, but in our country Vietnam wedding Liz had 3 wedding dress and hairstyle changes bought by her family before we arrived – boy was she surprised! 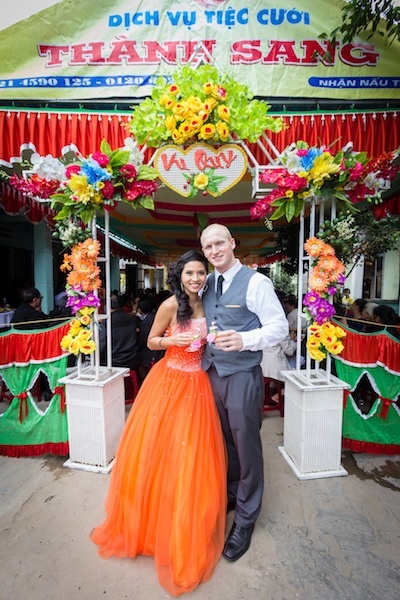 The first was the traditional Ao Dai for the traditional Vietnamese wedding customs, the 2nd a big, white, princess dress resembling more western wedding dresses for the “social wedding customs”, and lastly a big, orange, princess dress for party time. And when we say princess dress, these had some serious princess fluff! 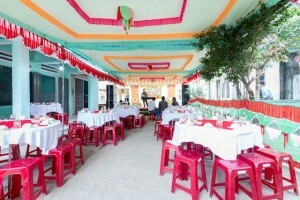 The “wedding area” is tented off and decorated with a flowered, ceremonial arch-way leading into an arrangement of rented tables and chairs – generally, tiny stool chairs that only Vietnamese people can fit on. TIP: Westerners do some yoga before you come to Vietnam! You’ll need to be more flexible to fit in their tables and chairs 🙂 This tented area is generally connected to the home and built out over the streets / alley ways that lead up to the home, blocking mostly all traffic but everyone knows there’s a wedding and to take a different route. Can you say – save some money on wedding venues?! Amiright ladies?! There is a presentation stage outfitted with confetti canons and fireworks (that we did not know about until they went off during speeches to MUCH surprise), wedding banner displaying the couple’s name and wedding date, and a full band + emcee ready to rock the house with some killer karaoke (more on that later). The wedding started with us being presented at the altar of our ancestors, most notably Liz’s “Ong Noi” and “Ong Ngaoi” aka the Grandpa’s. Typically Liz’s dad would present us, but because he was not there, Uncle #4** asked Liz’s Dad’s permission to present us to the ancestors at the ceremony with my dad’s side, and my Uncle Thu presented us at my mom’s side ceremony. After filling all the glasses on the altar with water from the sea and offerings, we stood before it, my Uncle’s lit the incense, we bowed 3 times, and then they spoke a blessing to the altar offering first our full names, waking up our ancestors to join us for the celebration, and bestowing health and happiness upon us as a couple. We then bowed 3 more times with the incense in gratefulness, and placed the incense on the altar. The members of the family got in a line and one-by-one each family offered a gift to us and a personal blessing. This consisted of either money (the most common and generally only gift in Vietnam weddings) or gold rings. While holding our hands, they offered us blessings of good health and 100 years of happiness together. At my moms family instead of each respective members of the family giving us a gift, they all gave us a gift as one. My Uncle Thu on behalf of the entire family presented us with matching gold rings with a small stone to be used as our wedding bands. They gave a short speech and then my Uncle placed the ring on Branden’s finger and his wife, my Aunt Thuy, placed the ring on my hand respectively. This was done on our right ring finger. Branden was then required to give a speech to the guests of the wedding to thank them for coming, and he also elected to give a speech specifically to me – “vows” if you will. With the help of our translator, Tich, Branden gave an amazing speech full of gratefulness on stage in front of our 100+ guests. Throughout the days after the wedding, Branden was repeatedly told how good his speech was – he really knocked it out of the park! Champagne toast, cutting of the “ceremonial” cake – but no cake for you! The wedding cake was a 3-tiered cake with the traditional figurines on top. We joined hands on a single knife and cut one slice of the ceremonial wedding cake, however this cake was not served to guests. After we got through the whole wedding, our photographer Conor was still eyeing the cake and finally asked – when do we get to eat the cake?! Well it turns out, the top tier of the cake (the smallest) can be eaten later by the Bride and Groom, but the large, bottom two tiers are instead delivered to all the neighbors and most notably, all the children in the village that are not at the wedding as a sign of good will. They serve the children in the village first as they believe “the children are everything, they are the future!” Sorry Conor, no cake for you. After cutting the cake, Branden shook up a bottle of champagne, popped the top so it foamed in celebration (and a lot of confetti shot into the air), we poured the champagne into the top glass and it trickled down into all the glasses in the pyramid full of colored water. 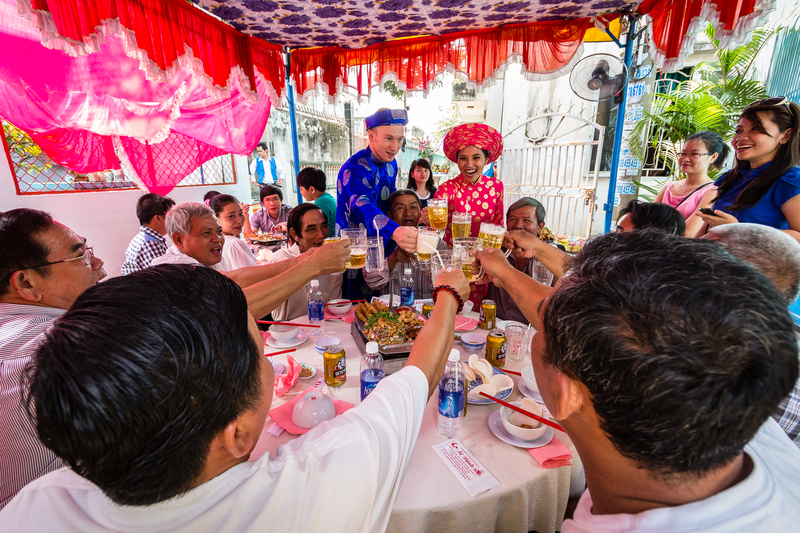 We grabbed our ceremonial glasses and some beers, and joined each table in a rowdy cheers of “Mot, Hai, Ba, Yo!” The Vietnamese equivalent chant of “One, Two, Three, Drink!” After making one round to all 11 tables, it was now time to party! SING, SING, SING! Dedicated songs personally sung to us by our wedding guests! Now it was time to party! In true Vietnamese fashion ,the food is the star of a Vietnam wedding. There were more plates and courses of food than we could count, and every 10 minutes or so we were instructed to do another round of all the tables to “Mot, Hai, Ba, Yo!” everyone. We didn’t count but the guests will confirm we made at least 15 rounds of all the tables. 11 tables x 15 rounds = you can imagine how much beer we drank on this wedding day! Oh and the dancing…there were a lot of opportunities for people to pull us on stage to dance and to be serenaded by our wedding guests. This lasted all through the afternoon. We want to give a special thanks to our translators, Hang in HCMC and Tich in Nui Thanh that truly made this whole event so meaningful for us. Without them creating a bridge in communication to our family, we could not connect as deeply as we did. There aren’t words to describe how grateful we are for you both. We also want to give a special thanks and shout-out to our friend Christian who joined us on the road in HCMC for our 1st wedding ceremony and allowing us to share our story and life with him. 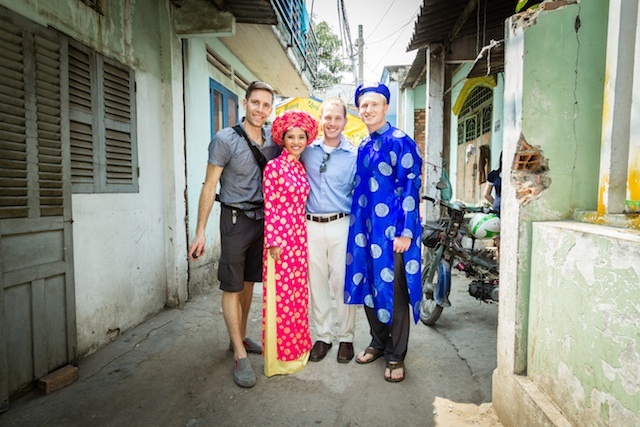 Christian is on his own multi-month travel tour right now and we were so fortunate to have him with us in Vietnam. And last but not least – our photographer Conor Musgrave, who flew across the globe and will continue to do so for the rest of this project. He not only capture amazing moments of this emotional trip, but stepped outside of the comfort zone to allow my family to show him their love – the man accepted so many hugs and kisses openly from complete strangers! 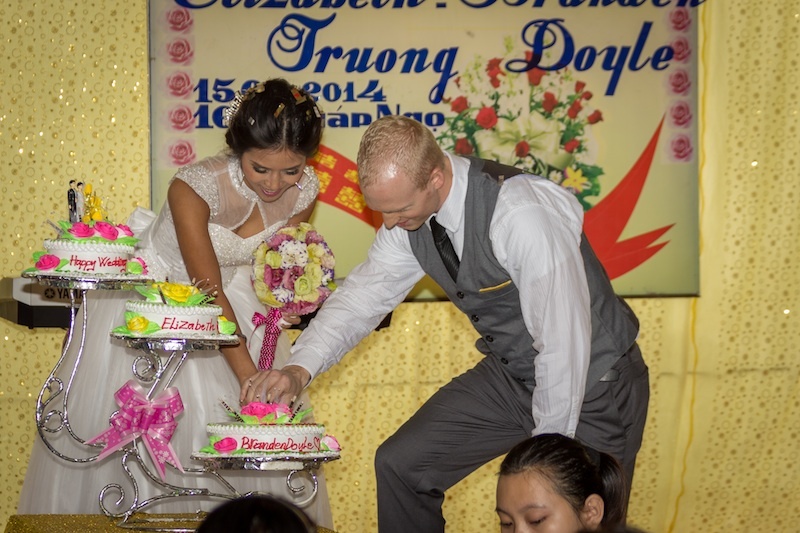 You can check out more photos from our Vietnam wedding in our gallery here that we will continue to update as photos are processed. 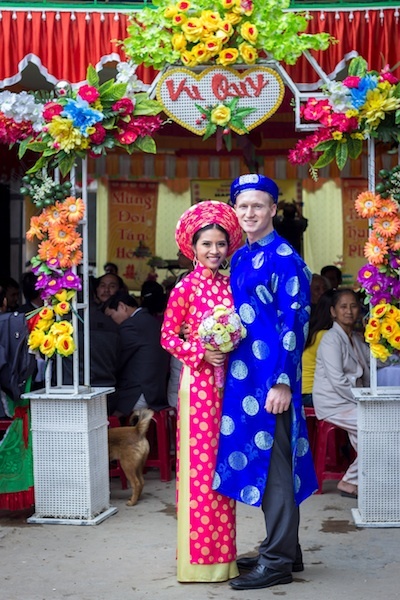 Thanks for reading about our first wedding – stay tuned for more photos on the other adventures we had while in Vietnam and a better reflection on what this country and project has meant to us. 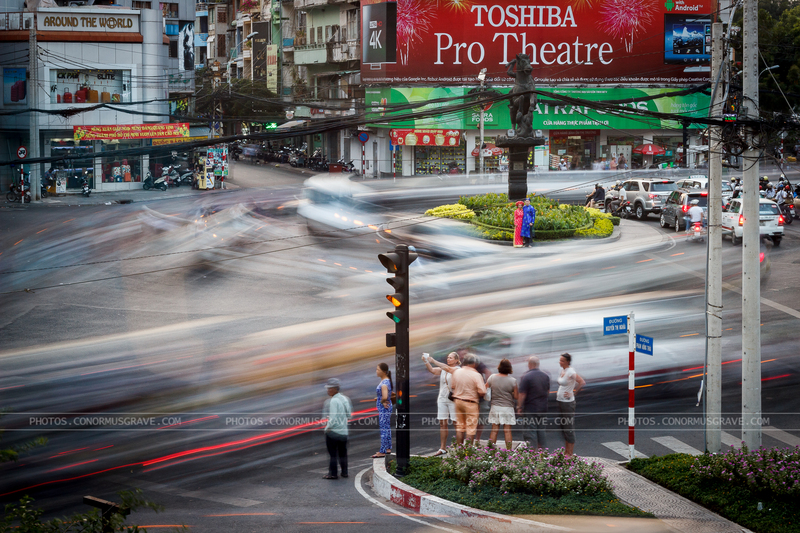 **In Vietnam you are addressed and referred to as whatever your birth order is within the family. Hierarchy of birth, especially in terms of respect, is very important. So my Uncle #4 was the 4th born on my Dad’s side of the family and commonly referred to as “#4” in the family. ***It is common not to smile in pictures in the Vietnamese culture.